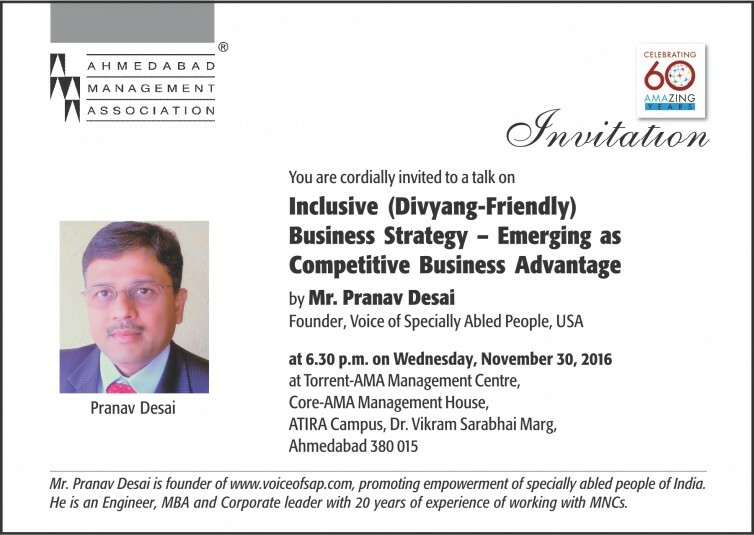 Voice of SAP Founder Pranav Desai will be speaking at AMA on this subject to group of Management and Business professionals at AMA (Ahmedabad Management Association), Ahmedabad. “Thinking Differently” is key to compete and grow the business. This talk will provide that perspective and data for competitive, sustained business advantages by adopting Inclusive (Divyang jan-SAP friendly) branding, hiring, operations etc. strategies. This talk is hosted by Ahmedabad Management Association (AMA), celebrating its 60th anniversary. It is open for all and no ticket to attend this event.